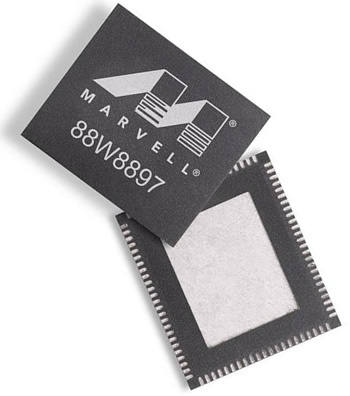 Marvell has pulled the curtain on its first 802.11ac chip, a debut which makes Marvell the second manufacturer to produce an 802.11ac solution thus far. The Avastar 88W8897 may feature a name only an industry OEM could love, but marks the first chip to ever pack NFC, Bluetooth 4.0 and 802.11ac onto a single package, Marvell claims. For anyone unaware, 802.11ac is a developing wireless standard which leverages the 5GHz spectrum, multiple streams and wider channels to reach speeds of 1.3Gbps or higher. It's thought that 802.11ac may actually replace 802.11n as it matures. Industry rival Broadcom began offering its own 802.11ac chipsets earlier this year, namely the BCM4360, BCM4352, BCM43526, and BCM43516. However, Marvell's Avastar 88W8897 seems better suited for use in mobile devices than its competitor's. In addition to being the only 802.11ac chip with NFC, Marvell's chipset diverges from Broadcom's line up physically, measuring in at roughly half the size. The 88W8897 is also expected to cost less -- up to 75 percent less -- than similarly featured alternatives. With these features, Marvell's intended market is clearly portable devices like smartphones, tablets and Ultrabooks. Broadcom chips, on the other hand, have been finding homes in stationary devices like routers from Netgear, Asus and Buffalo since their debut. It's worth noting this may continue to be the case. While Marvell's offering improves upon physical size and cost, it falls short in terms of performance with a maximum 802.11ac throughput of 867Mbps. This is most likely due to utilizing only 2 instead of 3 streams, unlike Broadcom's flagship BCM4360 chipset.